AnimalPets - Bird's Screaming, what to do? While sometimes a screaming problem starts because of boredom, loneliness, or frustrated mating desires, it is very common that screaming develops because an owner has inadvertently reinforced the behavior by rewarding screaming with attention. The problem doesn't develop overnight and there are no magic cures but good discipline and careful alteration of the owner's behavior patterns can often solve it over time. The first thing is to make sure that your tiel has his "basic training" -- the use of the "up command" and the laddering exercise that firmly establish your dominant position as flock leader. Status is everything in bird to bird interaction -- the phrase "pecking order" comes from the world of bird behavior. If the bird is boss in your house you will probably have behavior problems at some point. See the FAQ on training and taming if you aren't familiar with these. 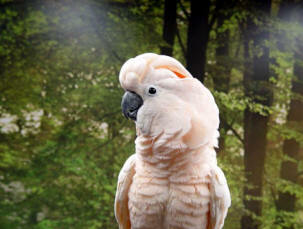 Next, you need to establish a routine for your bird care and for your interaction with the bird. Birds are creatures of habit and they like their lives predictable. Excessive spontaneity makes them nervous and insecure and when they are feeling this way they are more demanding of their human companions. Scheduling several shorter times during the day when you will be with the bird is better than having one long time that lasts for several hours but not having any other playtimes. (Excessive rigidity in scheduling is to be avoided as well since it creates a different set of problems but generally this is not found in households with screamers). Next, you will need to consciously alter your own behavior. Any sort of attention, even scolding, or the fuss and bother of moving the cage to another room, putting it in a dark closet, rushing into the room to make sure that it isn't hurt, etc. is a reward -- the bird got you to react to the screaming. Sometimes, people have had good results with quietly and quickly dropping an opaque cover over the cage when the screaming starts. If you try this it should be done with a minimum of fuss and the cover should be removed again as soon as the bird is quiet. If you leave it in place longer than necessary it will cease to be useful because the bird will not associate its own behavior with the presence or absence of the cover. If the cover does not quiet the bird within 5 minutes this technique will probably not be very useful to you since the cover did not affect the bird's behavior and placing it will act as an attention reward. As well as controlling your tendency to react to screaming you will need to learn to react positively to quietness. Train yourself to think about the bird each time you come near the cage in the course of your daily life. If the bird is screaming ignore it. If the bird is quiet stop a moment and tell it what a good bird it is and how happy you are that its quietly playing with its toys. Then pass on -- don't turn it into an unplanned play time. (Once the screaming problem is conquered you can be more open to spontaneous playtimes). Some bird noise is very loud but is not screaming -- its just the natural sounds of bird life. They are very vocal creatures and you can expect them to greet dawn and sunset with enthusiasm. They may get rowdy just before mealtimes and especially, if you work and the house is empty all day, when you arrive home. A sunny day may send a male into an hour of song just because life is so wonderful. One behavior that may be mistaken for or develop into screaming is the instinct birds have to call to any flock members who are out of sight. Personally I chirp back, just to let them know where I am and that no predators have gotten me. This problem is lessened if you are definitely established as dominant since then the bird isn't responsible for your well being. Its aggravated if your single pet thinks of you as a mate. Birds often get quite frantic when they are separated from their mates. Some cases of screaming are helped by getting a companion bird, especially when the screaming is caused by boredom, or by a single bird choosing a human mate who cannot spend all his/her time with the bird (this tendency of birds to bond with humans is why they make such good pets but unless you are invalid or housebound its unlikely that you can fill your end of what the bird expects of a mate -- some bird are more philosophical and accepting of this than others). If the screaming is due to your inadvertently training the bird to scream you've got a very good chance of ending up with 2 screamers if you buy a companion. If you actively want another bird but have a screamer and are worrying about the new bird catching the bad habit you will probably want to get the screaming under control first, then get the second bird.